Gray weather with occasional showers along a stationary front was giving firefighters a hand in tightening the cordon on a pair of wildfire complexes in West and North Texas. Three helitankers and three Type III helicopters are assisting with the fire. The Texas Forest Service said firefighters have contained about 50 percent of the blaze that has burned more 126,734 acres, destroying 166 homes and two churches. The decrease in acreage is due to more accurate GPS mapping of the area. 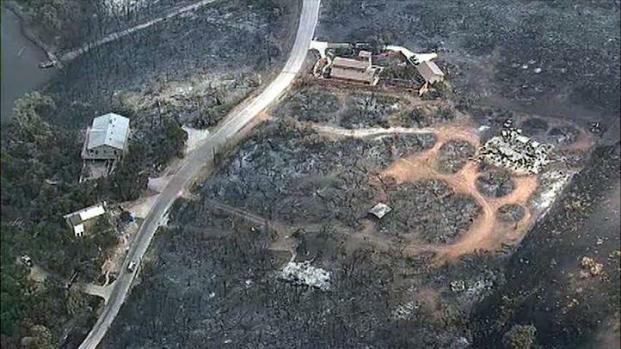 Residents who had first and second homes ravaged by the Possum Kingdom Lake wildfires got to see their homes for the first time since fires burned through the area. Their homes have been reduced to a gray heap of ashes, and acres of trees turned into blackened sticks. 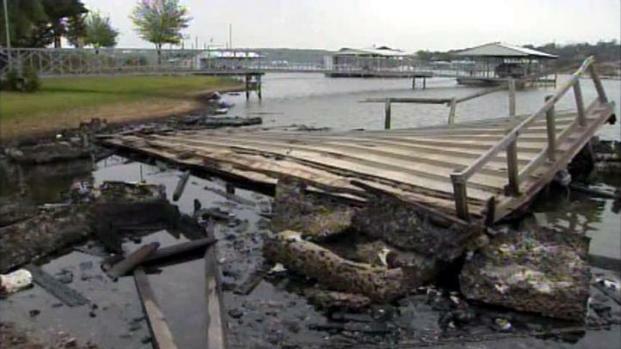 Yet many who live in a lakeside community ravaged by a massive Texas wildfire -- whether in a million-dollar mansion, a quaint lake house or a simple fishing cabin -- say they hope to rebuild and get back to watching the wildlife and whiling away the hours with loved ones. "Possum Kingdom is a state of mind," said Carolyn Bennis, whose dream house was destroyed in the fire that has charred miles and miles in three North Texas counties. "It's not necessarily a place. It's just your heart, and you just get addicted to it." On Friday, residents were allowed to return to some neighborhoods for eight hours to check out property damage or retrieve belongings from undamaged homes. They had to show proof that they owned property or lived there before passing through security checkpoints. Hundreds of residents were allowed into the area to check on their homes. The fire that erupted a week ago near the lake about 70 miles west of Fort Worth has destroyed more than 160 of the community's 3,000 homes -- mostly belonging people who lived there on weekends or during the summer. Two churches have also been destroyed. "This is an event that is going to mark time in our county's history," Palo Pinto County Sheriff Ira Mercer said Thursday. "It's something that is going to change forever the looks, and the community itself. I mean, it'll be life before the fire and life after the fire -- it's that big a deal." He said it will take years for the community to get back to what it used to be. Since Jan. 1, wildfires have scorched more than 1.4 million acres in the state and led to the deaths of two firefighters. 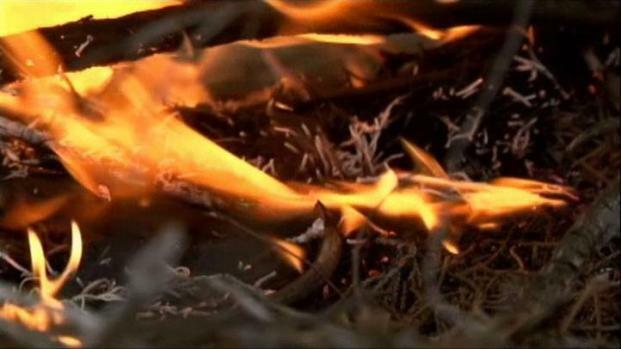 Cooler temperatures this week helped crews completely contain several massive blazes and half a dozen others in the state, although some still were burning. Bennis' three-bedroom lake house was atop a cliff overlooking Hell's Gate Cove at Possum Kingdom Lake, formed some 70 years ago by damming the Brazos River. Just last month, she and her husband sold their larger home in Cleburne and moved their belongings and family heirlooms into the lake house, dividing their time between the lake and a small condominium in downtown Fort Worth. She and her husband would watch deer nibble outside the kitchen window or sit on the deck sipping coffee or wine as migrating pelicans and ducks flew overhead and children splashed in the crystal clear water below. They had a big Easter weekend planned, and her 4-year-old grandson cried when he found out about the fire because he feared he wouldn't be able to hunt eggs. Next year, she told him. Bennis and her husband will rebuild. "Possum Kingdom is just a big deal for us," she said. "It's not just our house. It's where our heart is." On Friday Sharon and Kathryn Clark got to see their home for the first time since a wildfire burned it to the ground. The mother and daughter have spent six summers at their lakefront home in Gaines Bend, and they were looking forward to another. "It's like boating, jet skiing. There are so many memories," said Sharon Clark. All that's left now is part of their chimney bearing a lone star. Their family is among 45 homeowners in the neighborhood who also lost their first or second homes this past week but had to wait days just to find out. "The waiting. It's just really hard. It's like, is it there? Is it not? And you're like, maybe we'll get lucky, maybe we won't. And lady luck was just not on our side this time," said Sharon Clark. Most of the Clarks' neighbors say they'll rebuild, replace their belongings, and create new memories. "I've never been through this before, and it's like, where do we even start?" said Kathryn Clark. "It's hard, it's hard." As the intense fire swept through the area, it torched some homes while sparing others. In one home only three walls were left standing, and its garage was untouched by flames. A stone fireplace was all that survived next door. On another cliff across the cove, a fireplace towered over the heap that remained of the burned-out home, while an upscale house next door was not damaged. Some docks and boats in the lake below showed no signs of the fire. In some places, the blaze blackened fields down to the soil and charred trees, burning away even their branches. In others, trees and shrubs were untouched and a few wildflowers grew on the roadside. The fire also destroyed John McPherson's 1960s fishing cabin near Hell's Gate Cove -- which he'd finally bought in December after leasing for about four years, he said. McPherson, who lives in Abilene, said it had the same great views as nearby mansions "without the million dollar price tag." Because he had no insurance, all he has left is eight-tenths of an acre, a dock and the scorched and warped metal roof he put on just last summer. The mid-week cooler temperatures and high humidity that helped North Texas firefighters were expected to remain through the weekend. But forecasters said the hot, windy conditions dreaded by fire officials were expected to return Monday. Ball reported from Dallas. Associated Press writer Diana Heidgerd in Dallas and NBCDFW's Julie Tam also contributed to this report.